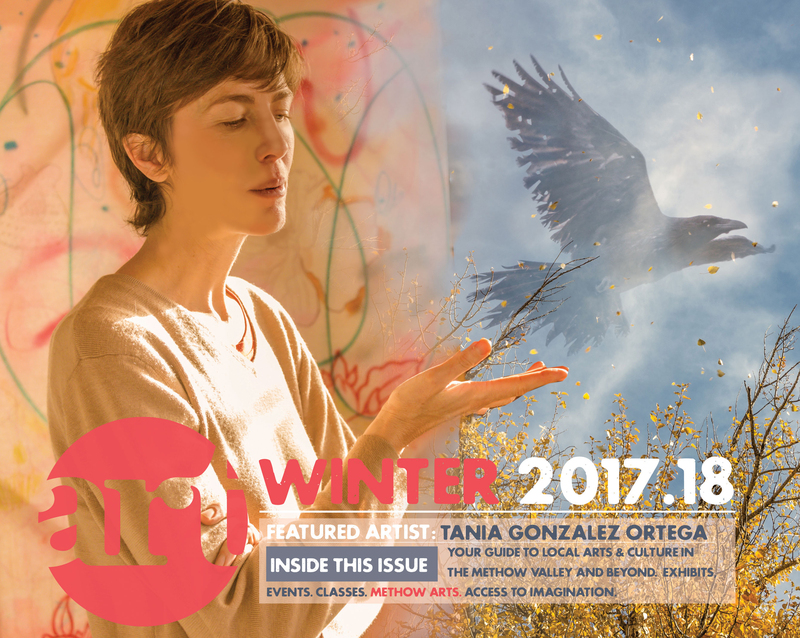 Tania Gonzalez Ortega is happiest when she’s painting, putting down layers of vivid colors, billowing gestures, and meticulously rendered birds and flowers. In contrast to the cliché of the tortured artist, Gonzalez Ortega finds endless satisfaction in art-making. In fact, she was so turned off by the pressure to make provocative, in-your-face art that she abandoned her artwork for a while. Gonzalez Ortega studied art at UCLA in the 1990s, when Los Angeles was on the cutting edge of the contemporary art scene. She arrived at college with a portfolio of traditional still-lifes and thought pretty pictures and skillful execution were what mattered. Overall, Gonzalez Ortega loved studying art at college and savored the exposure to different disciplines. She tried photography, ceramics, and sculpture before concentrating on painting. Looking back, she’s amused by the required class in “new-genre” art, which she admits she didn’t love. Gonzalez Ortega recalls her final project for the class, in which she and her boyfriend engaged in a frozen kiss for an hour on a busy corner in downtown Los Angeles while a classmate videotaped them. The pedestrians didn’t seem to notice, she said. her college professors were world-famous and extremely talented, but Gonzalez Ortega found their work dark and edgy. If that’s what it took to make your way in the art world, she wasn’t sure she wanted to be part of it. “I don’t want to live there. I don’t want to be constantly dancing with my demons,” she said. 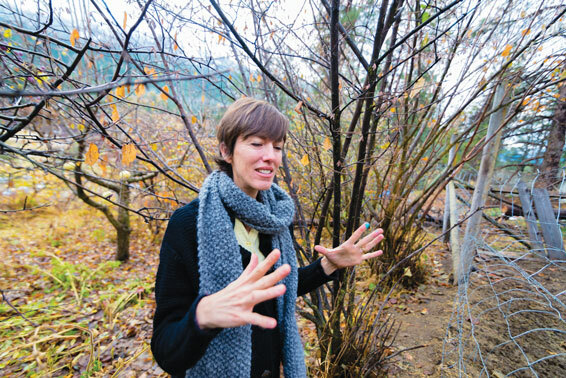 After she graduated, although she exhibited at a few galleries, Gonzalez Ortega took refuge in environmental activism and in education, ultimately teaching at a Waldorf school. Waldorf, where art is embedded in everything you do, suited her. Kids make their own books and everything you put on the board had to be beautiful, she said. 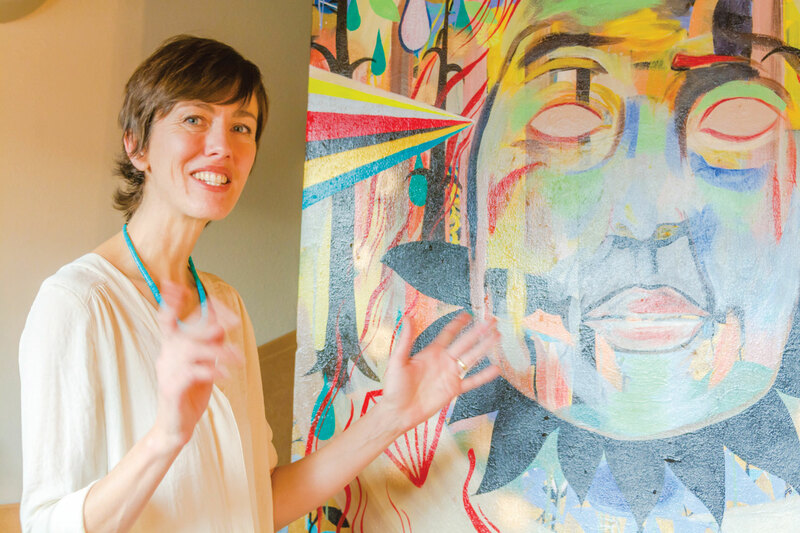 Between teaching and raising a son on her own, she had little time to make art. 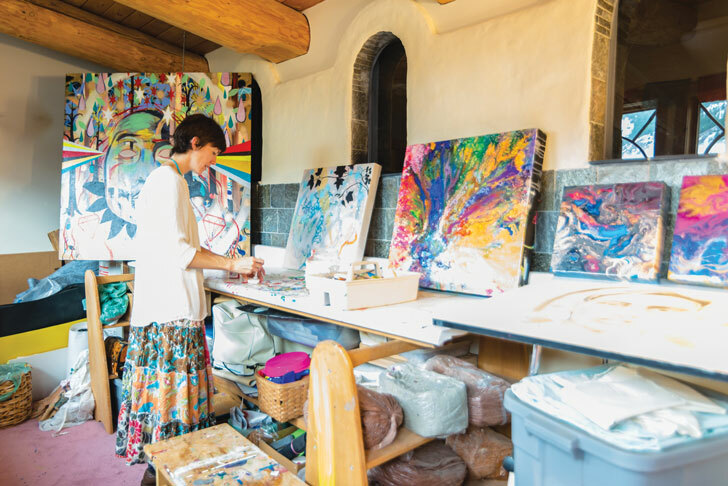 But after Gonzalez Ortega got married and moved to the Methow Valley in 2007, her husband was supportive of her setting aside time each week for her art. She started to exhibit in local galleries and to sell some of her paintings. Even more important, though, was letting go of the notion that she had to please the critics or the art word. “Allowing myself what I wanted to paint, regardless of what others wanted – that really freed me,” she said. “I’m definitely drawn to things that are beautiful in art, that are inspiring or that uplift the viewer,” she said. Gonzalez Ortega starts with a raw, untreated canvas and often wets it so that the paint soaks in and creates interesting patterns as it drips. 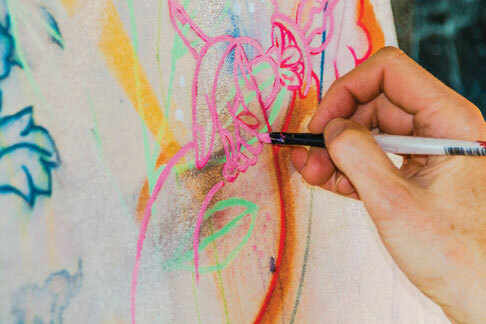 She follows that base layer with loose, free-form strokes – loops and whorls in chalk or spray paint. She loves the unrestrained freedom of expressionist painting, where she can let her emotions take over. “I may scribble with chalk and then add a wash of color,” she said. In the finished piece, some of those swirls show through, adding texture and complexity to the layers. The process of putting down layers gives her a sense for what comes next. “You get to escape from the mundane world and enter a place of endless possibility,” she said. Most of Gonzalez Ortega’s paintings include detailed line drawings on the surface, which highlight an image from beneath or superimpose a new idea. The drawings are usually from nature – outlines of the petals of a tropical flower, translucent birds, or fish reminiscent of Japanese prints. Loops and coils, kind or like exuberant graffiti, punctuate Gonzalez Ortega’s canvases, an usually end up partially covered with drawings of exotic blooms. One painting features scrupulously rendered scientific illustrations of flowers, colored with red and blue washes from the layers below. In another painting, a songbird outlined in black is superimposed on a tangle of crimson and gold flowers. Some of Gonzalez Ortega’s paintings contain such elaborate layering that they almost become abstract patterns. Others feature geometric shapes, stars and teardrops. Although Gonzalez Ortega is an extremely skilled draftsperson – people often ask if she uses stencils – it’s all freehand, with the detail added in colored pencil or paint. “I’m not interested in perfection – I want to show the artist’s hand,” she said. Gonzalez Ortega likens the art-making process to her practice of meditation. 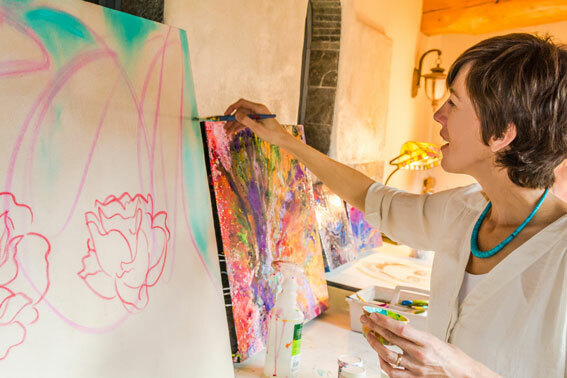 In meditation, her mind may be super-busy or calm and focused, and paintings can be the same way. Some paintings are relaxed and confident, coming together smoothly. “I’ll put something down and it’s just right,” she said. Gonzalez Ortega does know when a painting is done. “If it makes me feel like I can take a complete breath, that gives it a sense of completion,” she said. Her paintings often have a sense of whimsy. For example, she drew the Greek statues in vivid reds and greens. “They had a superhero-ish energy. But at the same time, I don’t take it too seriously,” she said. In fact, many people may know Gonzalez Ortega as the creator of a weekly editorial cartoon for the Methow Valley News. She also did editorial cartoons for the school newspaper at UCLA, but today, the culture is so polarized that it feels different, she said. As a result, she looks for a perspective that will give people a way to laugh about an issue. “It keeps me mentally agile,” she said. Gonzalez Ortega has to balance her art-making with a busy life as a farmer and the mother of two boys, ages 6 and 14. She and her husband, Carl Rapp, co-own Sunny Pine Farm on the Twisp River, where they raise 150 goats for cheese. 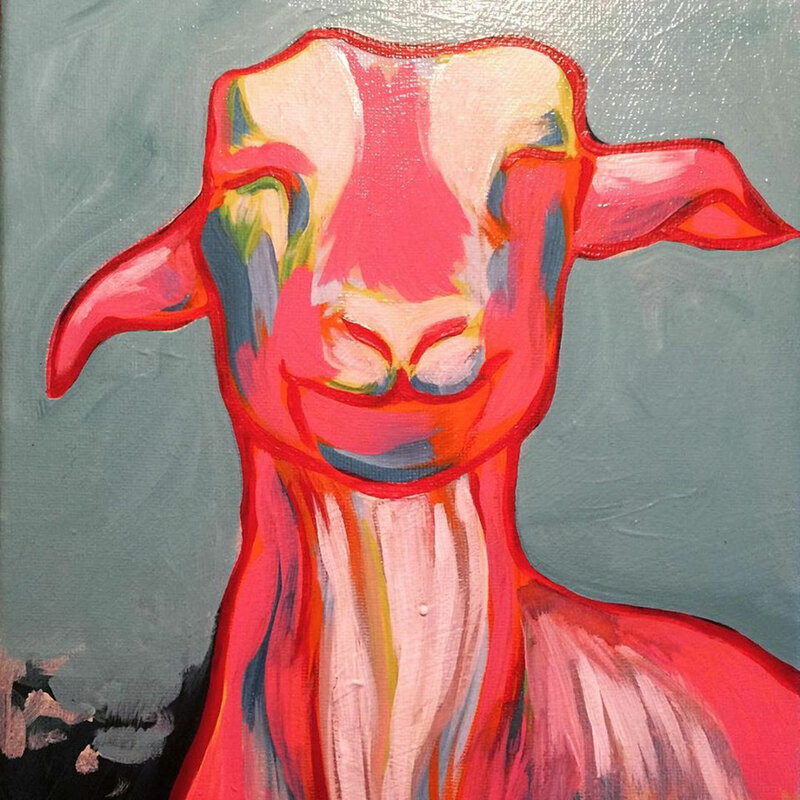 The goats have cropped up in her art, in a series of small, boldly colored studies. She tried to paint them in realistic browns and taupes, but chafed at the restrictions of mixing the right color. So the goats are a brilliant purple, orange and green, a kind of celebration of their personalities. And although she’s currently taking a break from the day care she operated for several years, Gonzalez Ortega is teaching art to high school students at a private school in Twisp. With these other responsibilities, Gonzalez Ortega tries to set aside a day or two each week for her art. But even when she’s not in her studio, she’s always incubating ideas, which usually allows her to pick up where she left off. With more time to devote to her art and the inspiration she derives from her layering process, Gonzalez Ortega is increasingly coming into her own. She’s sold paintings at local exhibits and online. Next year she’ll have a solo exhibit at a gallery in Seattle. “It’s exciting. Twisp has been good to me, but I want to expand,” she said. Gonzalez-Ortega will be featured in a solo exhibit at the MAX Gallery in Seattle next year. Dates are not set yet. Her art can be seen in an exhibit at Cinnamon Twisp Bakery through the end of December 2017. It is also online @ artbytego.blogspot.com and www.facebook.com/tegopaintings. Photographs were taken by Tom Forker. Enjoy his photos below.